There are many other services I subscribe to that use Facebook as the login mechanism. Granted most other services do give you the choice (create a new account or use your Facebook login), but since I’ve long since given up the utopian idea of privacy, using Facebook to login to Spotify is just another concession in exchange for free services. Ticked by default is the option to “Get personal recommendations by sending music you play to Facebook’s Open Graph.” The phrasing of this is slightly confusing and even misleading. Most people won’t know what “Facebook’s Open Graph” is and the promise of personal recommendations has yet to materialize in any meaningful way. Instead, what this really means is Scrobble to Facebook – in other words, it wants you to allow Facebook to keep a log of every song you listen to and to post it on your timeline for all your friends to see. Now this is the second big change that resulted in a fairly substantial backlash from users. At a stroke, Spotify as good as opted every user in to publicly publishing every song you listen to and for many people this felt like a step too far. As a seasoned user of Last.fm, the idea of publishing the songs I listen to is second nature to me. I love being able to easily see what my most-listened to artists were last year, for example, and have become so used to “scrobbling” that when I listen to, say, a CD in the car I feel slightly anxious that it’s not being logged. This record of my musical likes is the cornerstone to recommendations and has led to many social interactions and friendships with people who have similar musical tastes. 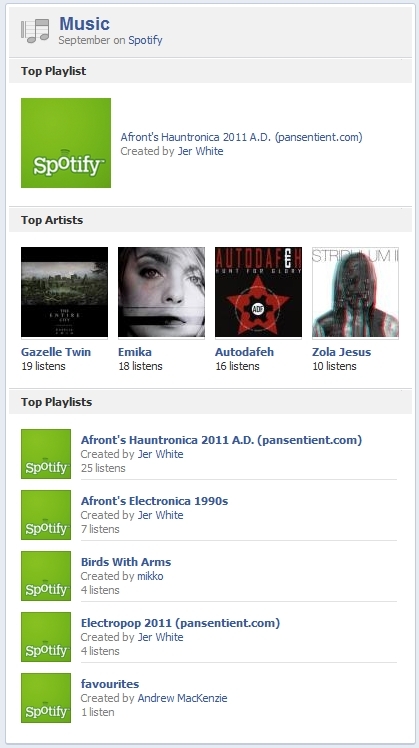 So I instantly saw the potential when Spotify enabled this in Facebook. It may spell the death of Last.fm which would be a shame, but it opens up sharing and comparison possibilities with many of my musical friends who never bothered registering on Last.fm. 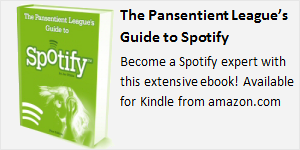 The backlash saw no sign of abating though, which led Spotify to take the unprecedented move to rush out a hot-fix called Private Listening (enable it from the File menu, but note it resets every time you restart Spotify). 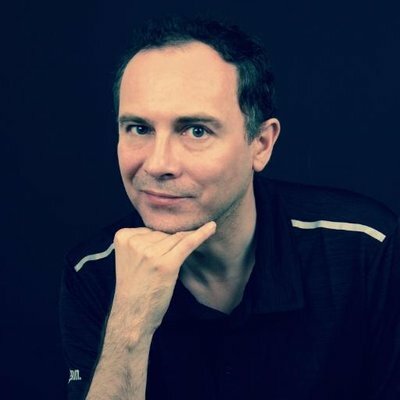 This puts Spotify in “stealth mode” and blocks your plays from being recorded by both Facebook and Last.fm. The tech and music press approved (“now you can hide your embarrassing love of Rick Astley/The Spice Girls/Noel Gallagher/Insert Music Prejudice Here“) and users now have the option to avoid spamming their friends. Personally I think disabling your plays would be a shame: you’d miss out on recording a rich archive of your musical tastes throughout the years, you’d lose the ability to see which of your friends enjoy the same music, and the complaint of spamming your friends is overstated. Facebook’s new Top Story algorithm favors status updates over “what I listened to,” and I don’t know about you but my Recent Stories stream is already full of my friend’s YouTube and SoundCloud likes anyway. 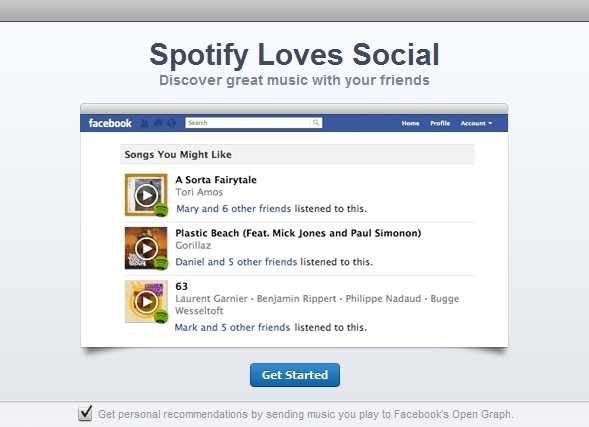 So what do you actually see in Facebook once you’re up and running with Spotify? 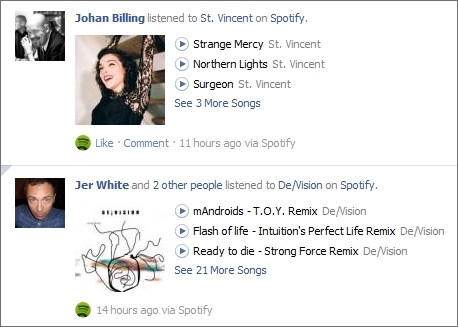 I can see that my friend Johan listened to some St. Vincent. I can click the little play buttons to listen too: the track instantly starts playing in my Spotify. I can click to pause the track without having to go to my Spotify client and I can click the “See More Songs” link to view the rest of the playlist. My friends can see that I listened to some De/Vision, and I can see that two other people also clicked and listened. This is a great feature I reckon: I’ve found it really useful to see who enjoys the same kind of music as me and it’s already led to some fun discussions through the Comment feature. Perhaps less useful is the Facebook live stream everyone now has in the sidebar on the right. 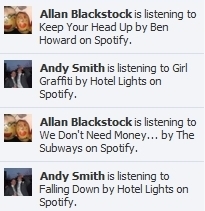 This Twitter-clone logs every single track played by all my friends in a constantly updating stream of uselessness. You can mouse-over an update here to display Spotify play buttons, and if you then mouse-over an artist name another pop-up displays to tell you which of your friends also “liked” that artist. But the sidebar is so full of every single Like, Comment and other kipple that I’ve already learned to block it from my field of view. I’m sure Facebook will improve this in the future (by adding some personalization options for example) but for now it’s mostly just noise. My friends can see that I’m listening to a track from the new Autodafeh album. It’ll appear on their sidebar straight away, and is grouped together in the Recent Stories stream once I’ve listened to a few tracks from the same playlist. It doesn’t matter how much of the song I’ve listened to: I could listen to only the first second and it is still logged and displayed. Last.fm usually scrobbles a track once you’ve listened to at least half of it, which I think is a much better way to handle updates. The mosaic is much more useful and copies how the playlist looks in the Spotify client, so it’s a shame it’s not used in the monthly summary section. Clicking the Music link shows you a page dedicated to music, with sections for Top Songs, Albums, Artists and Playlists. At the top is the “All Time” view with individual updates and monthly summaries following down the timeline. Every track, album and playlist listed here can be re-played with the click of a button, and as with all sections in Facebook you have the option to hide what you want from your public timeline. This page clearly takes much of its inspiration from Last.fm, although it does currently lack some of the finesse of that service. Remember at the start you agreed to “Get personal recommendations”? Well for the life of me I’m unable to find any kind of music recommendation in Facebook yet. I think I did see one artist recommended to me at the start, but since I switched to Facebook’s new-style timeline view I’ve not seen anything. Given that music discovery was supposed to be one of the key features of the Spotify-Facebook marriage, its absence is a glaring omission. Another disappointment is the lack of an embedded player: to listen to any of the Spotify music you still need to have the Spotify client installed on your desktop. Since I’m not allowed to install apps on the PC I use at work, I had hoped that an embedded web-based player would have allowed me to give up Spotify’s mediocre Android mobile app but that was not to be. In the lead-up to the Spotify/Facebook announcement it was fully expected that Facebook Music would allow cross-service listening. So, for example, if I posted a link to a track on Spotify, a friend who didn’t have Spotify but did have, say, MOG would still be able to listen to the song, since Facebook would translate the link on-the-fly to work in my friend’s preferred service. 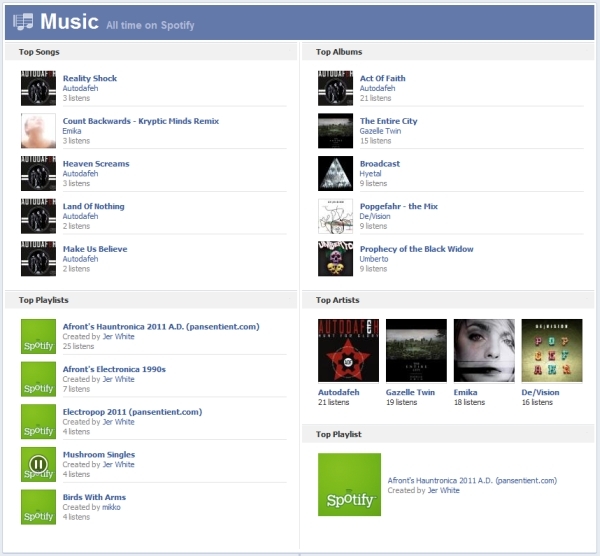 This was not to be however; Facebook’s music service partners remain siloed and independent of each other. Finally, the initial Facebook+Spotify demonstration showed that you could “listen along with friends” in a way not too dissimilar to Turntable.fm and its clones. So you could arrange a listening party and all your friends could listen along at the same time and discuss the music together in real-time. I’ve not seen this in Facebook yet, so I assume it was dropped from the initial launch. Hopefully this cool feature will be added soon. 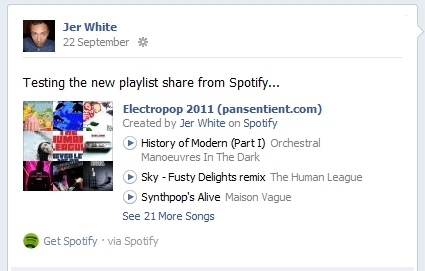 Q: What do you get when add Spotify to Facebook? In a way that sums up the changes but perhaps misses the point. Spotify is now further integrated into Facebook than ever before, but you still need the standalone player and (login issues aside) you can still carry on using Spotify and ignore Facebook completely. The Facebook login requirement was probably part of the deal to allow Spotify center-stage at the f8 announcement event (you may not have realized it but MOG, Deezer, Rhapsody and SoundCloud were all also “integrated” into Facebook at the same time) and I suspect Facebook may also be sharing some of the added royalty costs to cover the alleged one million new users gained. When I first tried out the new features I admit I was a little underwhelmed. It seemed that all they’d done was to add some play buttons to shared playlists (and you could already share playlists to Facebook from Spotify before the change). But now that I’ve used it for a week I’m beginning to see lots of benefits and handy extended social features, and the Last.fm-killing Music Dashboard starts to come into its own once you have some content in there.